What is the International Baccalaureate-Primary Years Programme (IB-PYP)? The IB-PYP is designed for students aged 3 to 12. It focuses on the development of the whole child as an inquirer, both in the classroom and in the world outside. It is a framework guided by six transdisciplinary themes of global significance, explored using knowledge and skills derived from six subjects areas, as well as transdisciplinary skills, with a powerful emphasis on inquiry. In the final year of the PYP, students carry out an extended, in-depth, collaborative project known as the PYP exhibition. This involves students working collaboratively to conduct an in-depth inquiry into real life issues or problems. Students collectively synthesize all of the essential elements of the PYP in ways that can be shared with the whole school community. It also provides teachers with a powerful and authentic process for assessing student understanding. The exhibition represents a unique and significant opportunity for students to exhibit the attributes of the IB learner profile developed throughout their engagement with the PYP. It enables schools and students to celebrate the transition of learners to the next phase of their education. 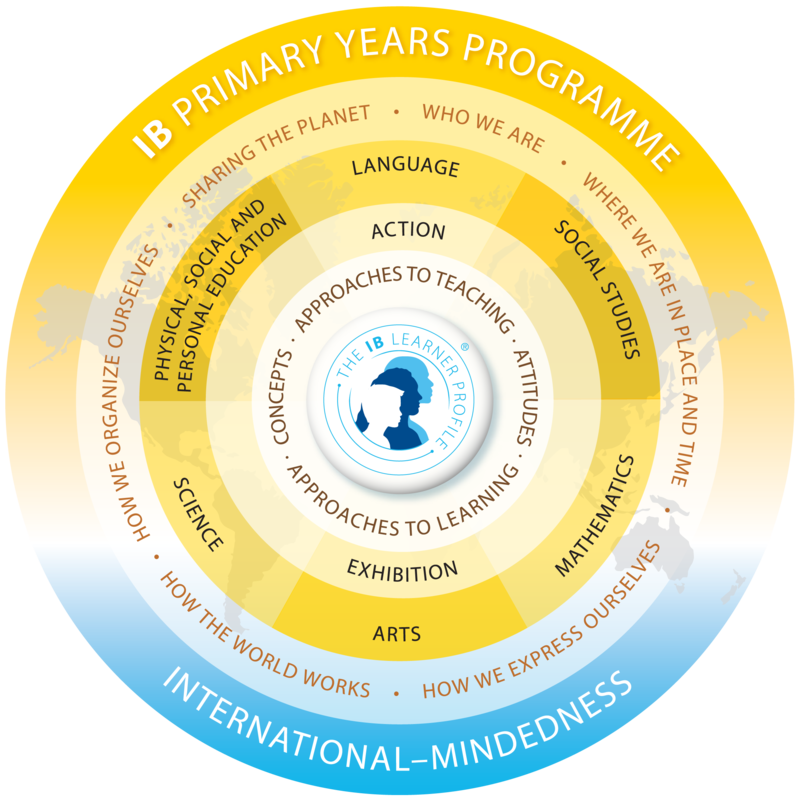 The most significant and distinctive feature of the IB Primary Years Programme are the six transdisciplinary themes, which provide IB World Schools with the opportunity to incorporate local and global issues into the curriculum and effectively allow students to “step up” beyond the confines of learning within subject areas. Inquiry into the nature of the self; beliefs and values; person, physical, mental, social and spiritual health; human relationships including families, friends, communities, and cultures; rights and responsibilities; what it means to be human. Inquiry into orientation in place and time; personal histories; homes and journeys; the discoveries, explorations and migrations of humankind; the relationship between and the interconnectedness of individuals and civilizations, from local and global perspectives. Inquiry into the ways in which we discover and express ideas, feelings, nature, culture, beliefs and values; the ways in which we reflect on, extend and enjoy our creativity; our appreciation of the aesthetic. Inquiry into rights and responsibilities in the struggle to share finite resources with other people and other living things; communities and the relationship within and between them; access to equal opportunities; peace and conflict resolution. Each theme is addressed each year by all students. (Students aged 3 to 5 engage with four of the themes each year.) In addition all PYP students have the opportunity to learn more than one language from the age of seven. These transdisciplinary themes help teachers to develop a programme of inquiries–investigations into important ideas, identified by the schools, and requiring a high level of involvement on the part of the students. These inquiries are substantial, in-depth and usually last for several weeks. Since these ideas relate to the world beyond the school, students see their relevance and connect with it in an engaging and challenging way. Students who learn in this way begin to reflect on their roles and responsibilities as learners and become actively involved with their education. All students will come to realize that a unit of inquiry involves them in in-depth exploration of an important idea, and that the teacher will collect evidence of how well they understand that idea. They will expect to be able to work in a variety of ways, on their own and in groups, to allow them to learn to their best advantage. La Scuola is an authorized International Baccalaureate-Primary Years Programme (IB-PYP) World School. Over 4,200 IB World Schools in 144 countries share a common philosophy—to create a better world through a commitment to high quality, challenging, international education. The IB education explores significant content by offering a curriculum that is broad and balanced, conceptual and connected. This method of teaching, also known as a “curricular framework”, incorporates critical thinking, problem solving, and exposure to a variety of viewpoints. A La Scuola education focuses on learners and promotes personal challenge, healthy relationships and ethical responsibility. The IB-PYP stresses learning both in a local and global context. It prepares a community of learners to engage with global challenges through inquiry, action and reflection. The IB-PYP focuses on the development of the whole child as an inquirer, both in the classroom and in the outside world. Structured, purposeful inquiry is the leading vehicle for learning. The IB-PYP philosophy fosters intercultural understanding within a global context. IB programs increase understanding of languages and cultures, and explore globally significant ideas and issues. At La Scuola, children learn traditional subject areas: humanities, math, science, social studies, arts, music, physical education and wellness within the interdisciplinary IB-PYP curriculum which allows them to learn beyond and across them. Acquisition of skills necessary to conduct inquiry and research. Active love of learning will be sustained throughout a lifetime. Explores concepts, ideas and issues to understand their significance. Acquires in-depth knowledge and develops understanding across a broad and balanced range of disciplines. Exercises initiative in applying thinking skills critically and creatively. Recognizes and approaches complex problems, and makes reasoned, ethical decisions. Understands and expresses ideas and information confidently and creatively in more than one language and in a variety of modes of communication. Works effectively and willingly in collaboration with others. Acts with integrity and honesty, with a strong sense of fairness, justice and respect for the dignity of the individual, groups and communities. Takes responsibility for one’s own actions and the consequences that accompany them. Understands and appreciates one’s own cultures and personal histories. Accustomed to seeking and evaluating a range of points of view, and is willing to grow from the experience. Shows empathy, compassion and respect towards the needs and feelings of others. Possesses a personal commitment to service, and acts to make a positive difference in the lives of others and to the environment. Approaches unfamiliar situations and uncertainty with courage and forethought. Has the independence of spirit to explore new roles, ideas and strategies. Is brave and articulate in defending one’s beliefs. Understands the importance of intellectual, physical and emotional balance to achieve personal well-being for one’s self and others. Gives thoughtful consideration to one’s own learning and experience. Assesses and understands one’s strengths and limitations in order to support one’s learning and personal development.